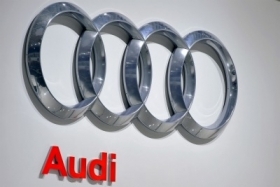 BERLIN -- Audi AG is hiring staff to increase car production, including a 57 percent capacity boost for the 69,600 euro A8 flagship sedan, on expectations that the luxury-auto industry will weather the stock-market slump. "We're extremely busy at the moment and have every reason to believe this uptrend will continue for some time, certainly through next year," Albrecht Reimold, head of the carmaker's factory in Neckarsulm, Germany, said in a telephone interview. Audi's second-biggest plant, where its 111,100 euro R8 sports car and the 48,900 euro A7 four-door coupe are built, is running extra shifts after adding about 500 workers this year, said Reimold. He expects output to jump 21 percent to a record 260,000 vehicles in 2011. The busy assembly lines at the plant in southwest Germany are part of broader expansion at the Volkswagen AG unit, which is adding capacity in Spain and boosting production in China. Audi, BMW AG and Daimler AG's Mercedes-Benz are adding shifts, shortening breaks and building new factories, even after economic gloom caused the Stoxx Europe 600 Index to tumble 23 percent from its February peak. "We're aware of expectations that conditions may change to the worse, but we trust our own forecasts suggesting that things will stay good," Reimold said in the Aug. 17 interview from the plant, which employs 14,000 people. BMW, Audi and Mercedes, the world's three largest makers of upscale cars, are targeting record deliveries this year, boosted by growing wealth in China and a rebound in spending in the U.S. after the recession. Last month BMW increased its 2011 sales forecast to 1.6 million vehicles from 1.5 million, while Audi, which aims to overtake BMW as the most successful luxury automaker by 2015, is targeting sales of 1.2 million cars this year. In July, Mercedes said that sales of its Mercedes and Smart brands will probably surpass 1.35 million in 2010, compared with an earlier forecast of 1.3 million. Still, with U.S. consumer confidence slumping to its lowest level since the 2009 recession and Europe saddled with a government debt crisis, even high-end auto manufacturers will feel the bite of a slowdown eventually, said Marcus Kappler, deputy head of economic analysis at the ZEW Center for European Economic Research in Mannheim, Germany. "BMW and other German high-end manufacturers are bucking the economy's stagnant trend" for now, said Kappler. "Over the longer term, German carmakers won't be able to decouple themselves from an economy that's clearly normalizing." The slowing economy could hit demand for high-end models next year, said Henner Lehne, a Frankfurt-based analyst at research firm IHS Automotive. The research company may lower its forecast for western European luxury-car deliveries in 2012 from its current prediction of a 6.4 percent gain to account for the "new economic realities," he said. "Customers are becoming more cautious," said Lehne. "Big-ticket items sell less well in difficult times." IHS already reduced its projection for U.S. auto demand this year by 200,000 light vehicles to 12.5 million cars and trucks. It also lowered its forecast for 2011 German passenger-car sales by 25,000 vehicles to 3.24 million. Next year could be tougher. Slowing economies, volatile financial markets and austerity policies to fight debt may cause world auto markets to stagnate in 2012, said Ferdinand Dudenhoeffer, director of the Center for Automotive Research at the University of Duisburg-Essen. "This unfavorable constellation may bring about a distinct cooling of world car markets," Dudenhoeffer said, adding automakers face excess capacities and shrinking profits after expanding production and hiring this year. A slowdown may not hit luxury-car makers as hard because their customers have money to spend even during a downturn, IHS's Lehne said. For its part, BMW isn't currently experiencing a slowdown and is expanding capacity to fend off Audi. "The demand for vehicles is still very high," said Jochen Frey, a spokesman for the maker of BMW, Mini and Rolls-Royce vehicles. BMW shortened the summer break at its Munich factory, and will run component factories in Austria, the UK and Germany without a halt, he said. The manufacturer is adding additional capacity in South Carolina and may build an assembly facility in Brazil after production bottlenecks restrained growth in the first half, CEO Norbert Reithofer said Aug. 2. Mercedes is also boosting output. The carmaker added Saturday shifts and extended production hours at its largest factory in Sindelfingen, Germany, to meet demand for C-, E- and S-class models. Its factory in South Africa is producing on Saturdays this month to boost production of the C-class, which was updated earlier this year. The carmaker is also building a plant in Hungary to produce a new line of small cars. Audi is adding 1,200 technicians, engineers, and other skilled workers this year to bolster its challenge to BMW. The unit, which accounts for more than 40 percent of VW's profit, suspended summer holidays at its main factory in Ingolstadt to maintain output of the Q5 SUV. It also extended around-the-clock production of the Q7 SUV at a plant in Bratislava, Slovakia, until the end of the year. At the Neckarsulm plant, a third shift for the A8 was added in July, taking daily production to 180 vehicles from 115. The plant is also being refitted to ramp up production of sporty "S" variants of the A6, A7 and A8 models, which will hit showrooms next year. The plant is due to produce 300,000 vehicles in 2012, up from 260,000 this year and 180,000 in 2009, when the financial crisis hit sales. "The plant is buzzing," said Reimold. "There's no respite even though we're in difficult times."